rec. Air Lyndhurst Studios, London, dates not given. “ Why on earth didn't I know one could write a cello concerto like this? If I'd only known, I'd have written one long ago!” This remark, attributed to Brahms late in his life, referred to Dvořák's cello concerto. Since its premiere in 1896, it has occupied an essentially uncontested first place in the cello concerto repertoire, and has been essential playing and recording for anybody who hopes to make their mark as a cello soloist. Enter Nina Kotova. Paul Shoemaker (see review) claims that “Nina Kotova is the most beautiful cellist in the world, and, simply, she is also the finest cellist I have ever heard.” I'll let the first claim stand; the second, however, from my perspective, is not borne out by this particular Dvořák performance. There's nothing wrong with it - it is simply middle-of-the-road, soft-edged, and uninvolving throughout. It is a competent performance that never catches fire. The soloist and orchestra work hand-in-glove; they sound like one instrument. While an impressive feat, and part of what Dvořák sought in his composition, it may also be part of the problem: not enough contrast to stake out the drama. Kotova, Litton, and the Philharmonia would lead one to believe this is an easy-going, low-key piece. My favorite modern recording is a bit off the beaten path: Frans Helmerson's with Neeme Järvi and the Gothenburg Symphony (BIS CD-245). Soloist and orchestra work together, or off one another, as needed, to maintain tension, dynamic contrast, and the narrative long-line, making for a far more gripping, compelling experience than Kotova provides. One could build a small library of worthy older recordings. The top of my list is Pierre Fournier, who in a recent box set has been styled “aristocrat of the cello”. Both this set (Deutsche Grammophon 477 593-9) and the budget single CD (429 155-2) have his recording with the Berlin Philharmonic and George Szell. The “Serenade in D minor for Winds, Cello, and Double Bass”, the longer version of its name, fares considerably better here. Perhaps Kotova and the other performers feel more comfortable with the chamber-like scale and equality of interaction. Or maybe the lighter, dancing textures that draw upon Mozart. Whatever the reason, there is energy and dynamic contrast here — the performers sound like they are having fun — things bounce along quite happily. If this piece were the main attraction of the disc, I would recommend it. 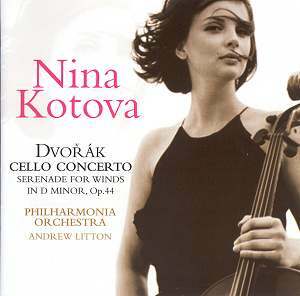 On that basis, and her previous disc linked to above, which I’ve also enjoyed, Nina Kotova has a lot of potential and I look forward to hearing more from her. But on the crowded battleground of the cello concerto, this issue simply cannot compete.